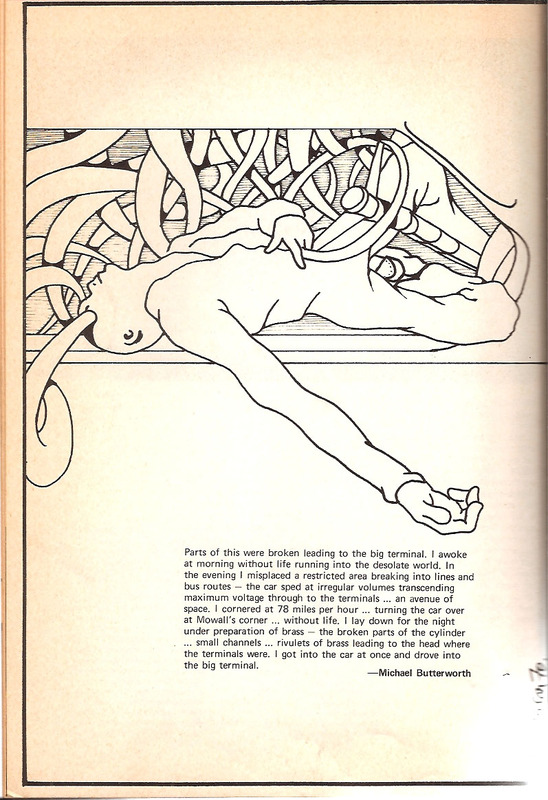 (1) Roger Luckhurst’s introductory essay “Re-Reading Breakthrough Fictioneers”; (2) extracts of the Richard Kostelanetz introduction to Breakthrough Fictioneers, proposing anthology as polemic; (3) a scan from Corridor8 writer Michael Butterworth of his contribution to New Worlds #199 March 1970 (illustration by Allan Stephanson), which was later published in BF, minus illustration. The Corridor8 project appears alongside Michael Butterworth’s interview with Richard Kostelanetz for soanyway.org, which has itself been expanded into a special issue of Derek Horton and Lisa Stansbie’s online magazine. All of these projects and Richard Kostelanetz’s work more broadly is part of a round table event co-organised by VerySmallKitchen at the Portable Reading Room in Leeds City Art Gallery, March 10th, 2012, 1.00-3.00pm, with David Berridge (VerySmallKitchen), Michael Butterworth (Corridor8), Rachel Lois Clapham (Open Dialogues) and Derek Horton (soanyway.org). 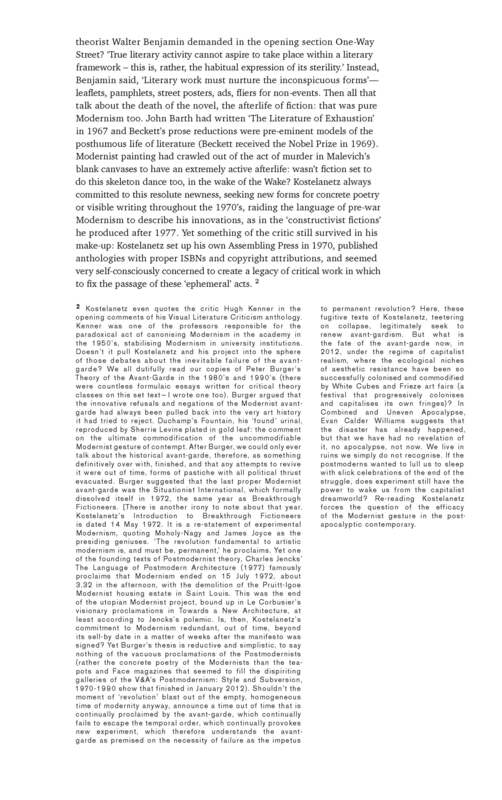 This text can also be read as a PDF here. These innovative works [by Barth, Nabokov, Borges, Barthelme and Crumb, amongst others] suggest that “fiction” can be most generally defined as a frame filled with a circumscribed world of cohesively self-relating activity. This fictional material may be primarily human, naturalistic, or stylistic, which is to say that fiction may predominantly deal with people, or things, or merely a certain linguistic style and/or formal device; but within fictional art is usually some kind of movement from one point to another. In these respects of diversity and change within an acknowledged frame does fiction particularly differ from poetry, which emphasizes concise, static, generally formalized statement. Fictions tend towards fullness, while poetry is spare, fictions encompass , whilst poetry concentrates; fictions go, while poetry stops. Fictions thus favour sequential forms (and yet remain distinct from film), as the difference between the material on one page and its successors (and predecessors) often generates the work’s internal event. 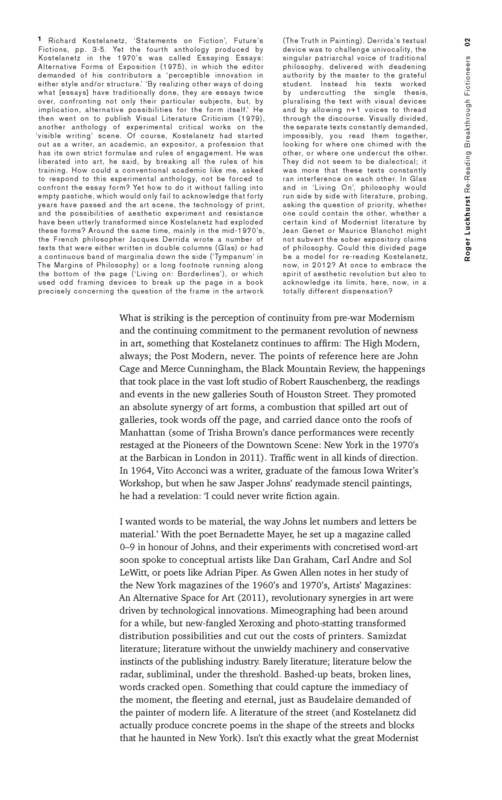 For instance, a single page of Raymond Federman’s richly inventive Double or Nothing (1971) might succeed, in isolation, as a graphic picture or “word-image,” where visualizations of various kinds complement the marvelous language; but Federman’s frames in sequence, abetted by sustained preoccupations, begin to weave a fictional action not evident in one alone. More specifically, just as one page can facilely follow from another, so can it drastically contradict its predecessors – an esthetic interface also possible in the similarly edited arts of film and video-tape, but not in live performance, whether on stage or television, or in a lecture. That is, the act of turning pages, which is condusive to sequence, can introduce non-sequential material that is nonetheless artistically related, and in this respect can the interfacial forms of certain fictions resemble this entire anthology. 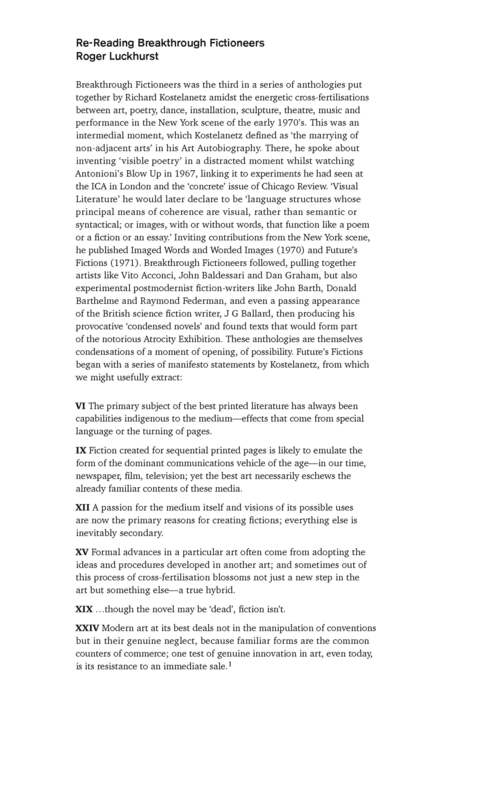 On the other hand, even within a single page can sometimes be compressed a world of artistic activity that is ultimately more fictional than poetic, as well as yet more reduced than Beckett’s Nouvelles textes pour rien (1958), to mention one prior milestone of literary minimalism. 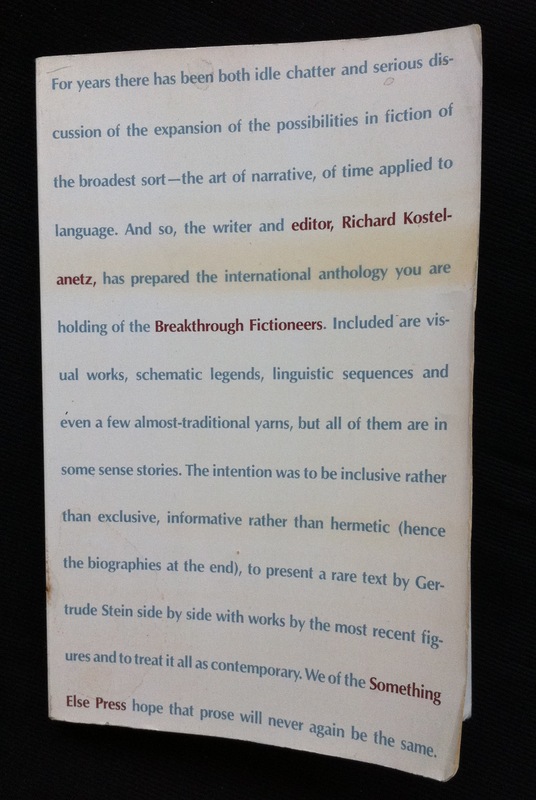 from “Introduction” by Richard Kostelanetz, Breakthrough Fictioneers: An Anthology (Something Else Press, Barton, 1973). Extracted from Rachel Lois Clapham “Writing AVANT GARDE PERFORMANCE”, forthcoming at Soanyway. SOURCE: RIchard Kostelanetz On Innovative Performance(s): Three Decades of Recollections on Alternative Theater (McFarland & Company, 1994). Einstein on the beach (Brooklyn Academy of Music). It was an authentic reproduction, and it was spectacular. What struck me most was how classic it had become and how it would always be a classic. Even though Lucinda Child’s choreography replaces Andy de Groat’s, it is not sufficiently distinguished to change anything. (My recollection is that Andy de Groat depended mostly upon spinning, whereas this is mostly circular movement.) One stylistic mark of the work is repetition, down to Linda Child’s monologue, another is the slow pace. Both these qualities now strike me as terribly dated. Samuel M. Johnson, an elderly black man eight years ago, now seems more infirm than before, but his concluding monologue, delivered from a locomotive cab, struck me as especially brilliant. Some of Wilson’s moves seem even more derivative, such as the pseudo-mysterious rectangle that appears from time to time, reminding me of 2001. The so-called knee plays seem ever more inconsequential. Toward the end Philip’s music appears to get bored with its own style, as each of the instrumentalists takes solos that strike me as terribly UnGlassian. I’d like to see it again, nonetheless. (December 1984). 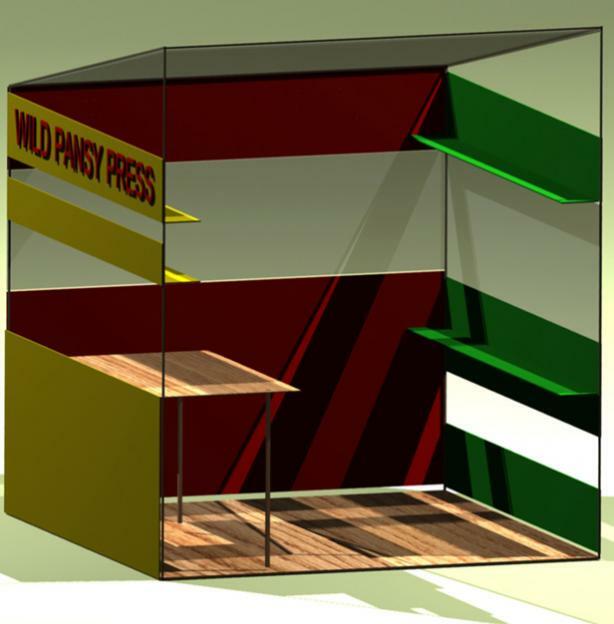 Other attempts to think through the legacy and contemporary presence of RK’s work include The Richard Kostelanetz Bookstore at Kunstverein in Amsterdam. The Corridor8 Breakthrough Fictioneers supplement will include work by Anna Barham, Pavel Büchler, Ben Jeans Houghton, Richard Kostelanetz, Roger Luckhurst, Carol Mavor, Charlotte Morgan, David Osbaldeston and Imogen Stidworthy.